In an enviable location suspended between the sea and olive trees, La Chiusa delle More is set in the Gargano National Park, 500 metres from the sea and 1.5 km from Peschici. 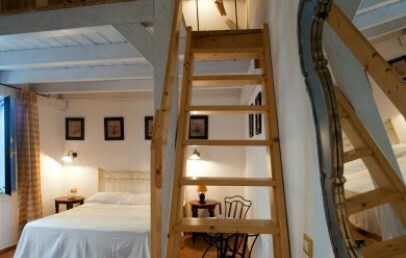 A restored farmhouse dating from the beginning of the 16th century, today La Chiusa delle More is a charming owner-run country house that guarantees a warm welcome and attentive and dedicated service. The Masseria welcomes every child from 5 years on. The country hotel has just 10 guest rooms, all with individual entrance and furnished with wrought iron beds and luxury bed linen. 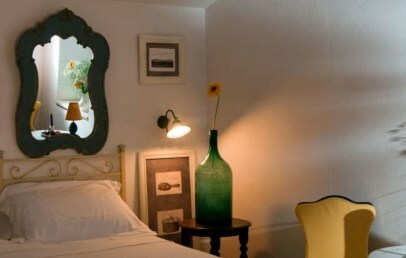 All rooms are double rooms and offer guests air conditioning, a mini bar and Sky TV. Bed linen is changed twice a week and towels are changed daily. Four rooms can be transformed into twin rooms upon request. Jalillo beach is the closest to the hotel, a mere 500 metres away: it is a serviced beach and the beach fee should be paid on-site. There are plenty of other beaches to be found close by the hotel: the Gargano peninsula actually boasts some of the most beautiful beaches in Puglia. The varied and wholesome breakfast offered at La Chiusa delle More includes freshly-squeezed orange juice, tarts, fresh ricotta cheese, honey and many other delicacies, and is served on the panoramic terrace overlooking the olive grove. Dinner can also be taken on the terrace, providing guests with an opportunity to savour the delicacies offered by the restaurant, aptly called "La Terrazza". The dishes are modern but inspired by tradition; they recapture and intensify the products that are the pride of the Gargano land: extra-virgin olive oil, oranges, lemons, sea food and local meats, all accompanied by the best local wines. Guests can enjoy the pool, mountain biking (subject to availability, upon reservation) and a car park. The area is rich in historic and natural jewels. La Chiusa delle More’s staff is on hand to provide guests with information on excursions in the local area. Pets are not accepted in the hotel. 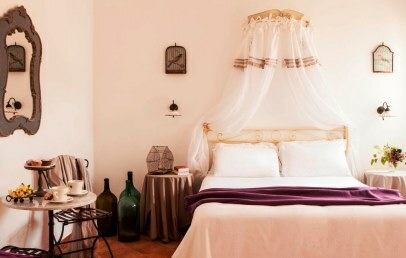 Each room is unique; all have an individual entrance and wrought iron beds. Some rooms (4) can be set up with twin beds upon request. All rooms have an en-suite bathroom with shower. Bed linen is changed twice a week and towels are changed daily. Garden view. Spacious accommodation ideal for a family up to 4 people. It has individual entrance. Some have a mezzanine with sofa bed for children. The bathroom has a shower. Bed linen is changed twice a week and towels are changed daily. Garden view. Each room is unique; all have an individual entrance and wrought iron beds. Some rooms (4) can be set up with twin beds upon request. All rooms have an en-suite bathroom with shower. Bed linen is changed twice a week and towels are changed daily. Garden view. Max. occupancy 3 people. Special 10% reduction for stays from May 20th to May 30th!